Collins Booksellers - 04: Yes, I Can Public Speaking by Jesus Roberto Torriani Vargas, 9781311283412. Buy this book online. At some point in our lives, we have to stand before a group of people ... and talk. In most cases, it is the experience, especially mistakes, which is teaching us. When these errors occur in a workplace, they can be very negative for our professional advancement. After witnessing a case, really dramatic, an engineer who had to make a presentation in front of his general manager and me, who was General Manager of an associated company, decided to systematize the subject ... and applying simple principles and techniques that are included in this ebook, can act successfully as University Teacher and as a business consultant. The document begins by briefly describing the basic process of communication and then focuses on the characteristics of a Presentation activities: preparation, implementation and evaluation. Finally presents a classification of the types of people you can find in the audience and how to act in front of each of them. 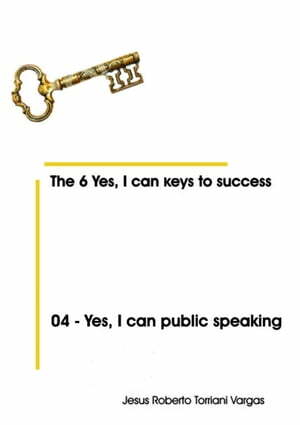 It is the fourth member of the series "The 6 Yes I can Keys to Success".